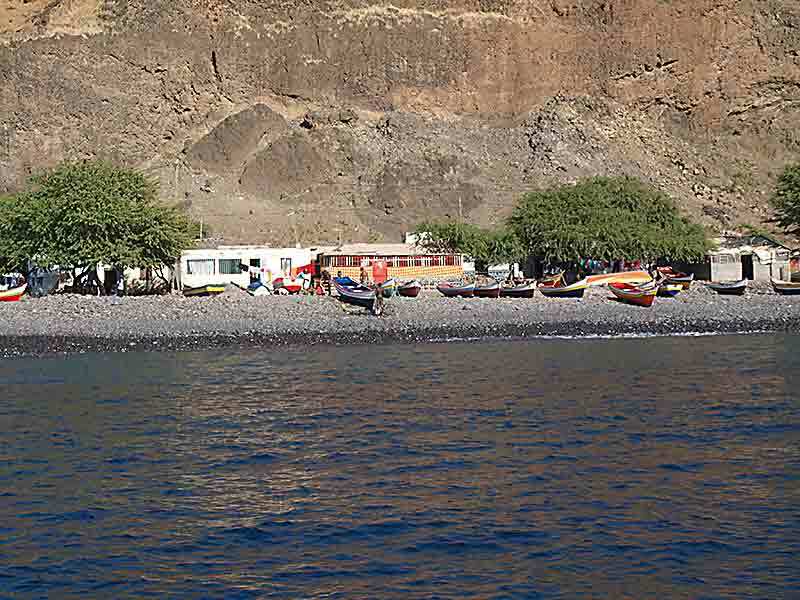 Most yachts that visit Praia only seem to stay long enough to stock up on provisions and carry out the formalities for leaving the Cape Verdes. They miss exploring yet another fascinating island. We hired a car for just 44 Euros and couldn't find anyone to sell us a map so made our way around the island with just our travel guide. 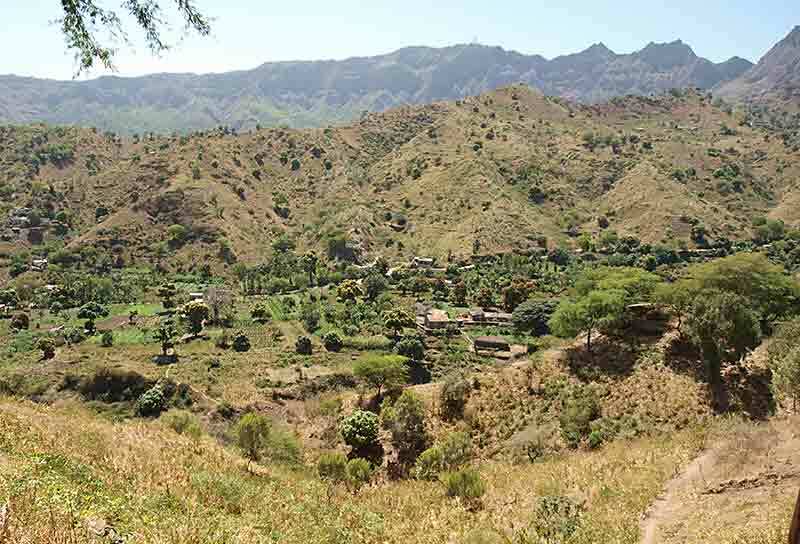 The roads are good and the scenery is fantastic, not just the stark volcanic mountains seen along the coast but also green, extensively cultivated valleys. 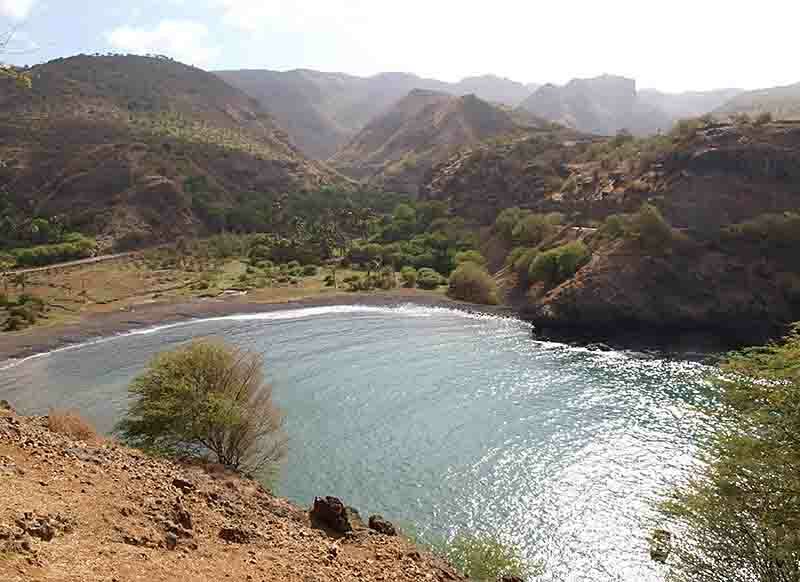 Santiago is the largest and most populous of the Cape Verdes and there are settlements wherever food can be grown or caught. The people are very industrious and friendly. 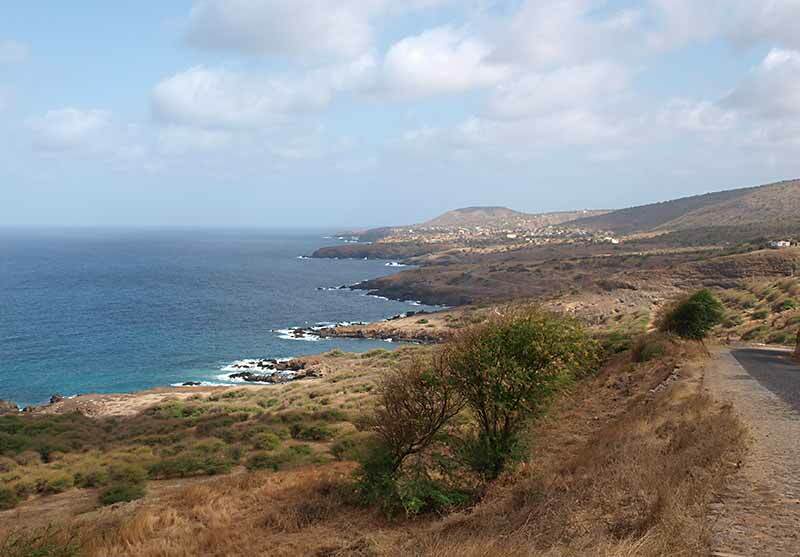 Wild flowers, birds and insects are much more diverse and abundant than on the other islands. The north east coast is especially lovely with many deep coves, fishing villages and fertile valleys. So impressive that we even got to the stage of ignoring the ugly unfinished buildings that blight every village! We rushed through it all in a day and came to the conclusion that we could have spent at least 3 days exploring inland. And, by the end of our visit we even got to quite like Praia (though not the port area which we were happy to avoid until it was time to leave). It's a vibrant place - showing signs of growing prosperity - and has helpful taxi drivers! On Thursday we went to the Frontier Police and got exit stamps in our passports. We then went to the Maritime Police where we explained that we were going to Brazil but wanted to visit the smaller islands Fogo and Brava on the way (which don't have Frontier Police). The Harbour Police duly issued us with a clearance certificate for Fogo. 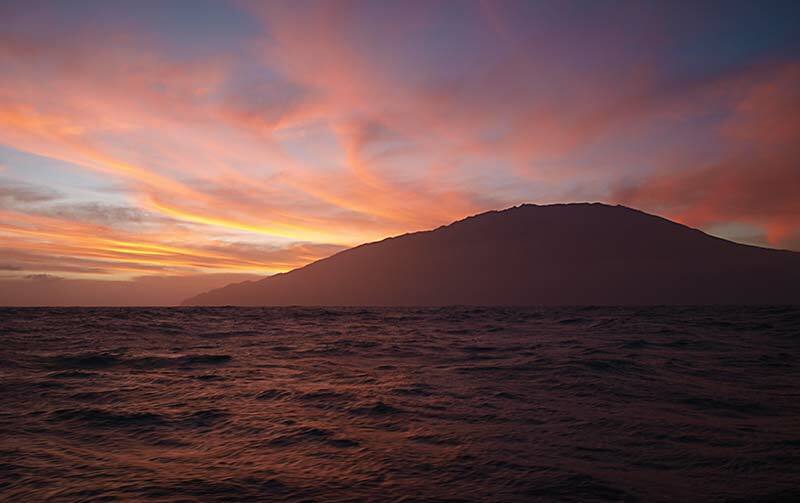 That evening we set off and had a reasonably fast sail, approaching Fogo in the moonlight. 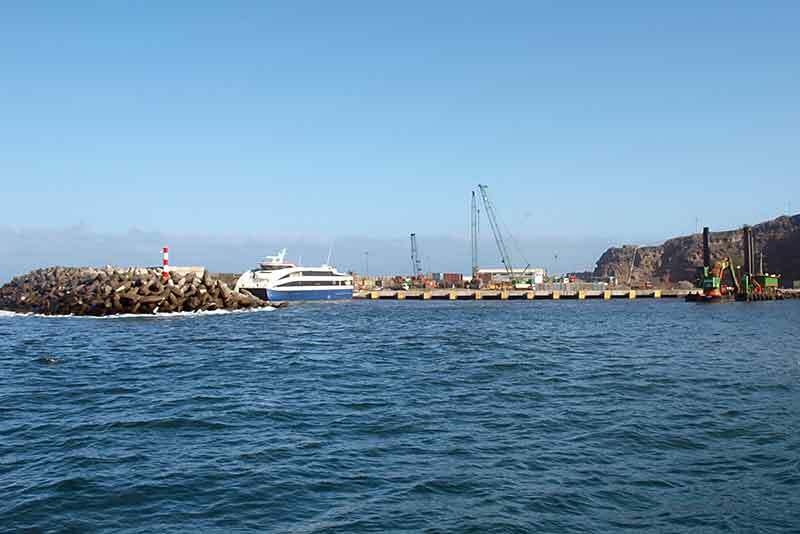 By Friday morning we'd reached the only harbour on the island at Vale do Cavalieros. It's being rebuilt and, as we approached, looked decidedly uninviting. Although still operational the harbour was a building site - note the red and white lighthouse . . . 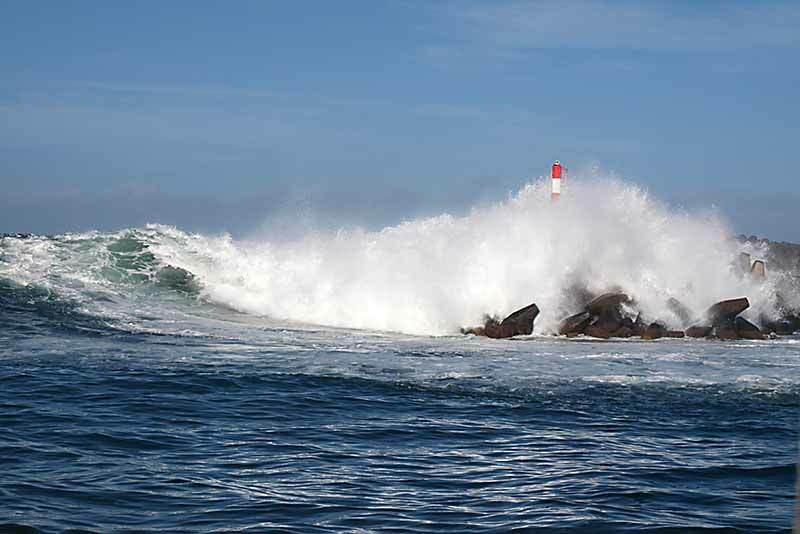 The dreaded northwest groundswell had appeared overnight and was sending big waves over the breakwater and into the anchoring area. . . .that's coming our way - it's time to get out of here! We couldn't stay there in those conditions so made our way to the main harbour on the island of Brava, just 10 miles further on. Brava is a small island with just a small harbour but the welcome is big. There was already one yacht at anchor. Because of the limited space and the variable winds off the mountains we needed to take lines ashore. After we dropped the anchor, our neighbour took our long line to the boulders in his dinghy, saving us a swim. A friendly local tied it to the rocks. We blew up our dinghy and took a second line and chain (to eliminate chafe) which our new friend fastened carefully. As soon as we were secure we made our way ashore to find the Harbour Policeman. Having officially left the country we were not sure how we'd be received. By this time we'd met another friendly local so all four of us went to the office. The procedure turned out to be very straightforward and we now have a clearance certificate for Brazil. Before leaving we're going to hop on the ferry for a day trip to Fogo.